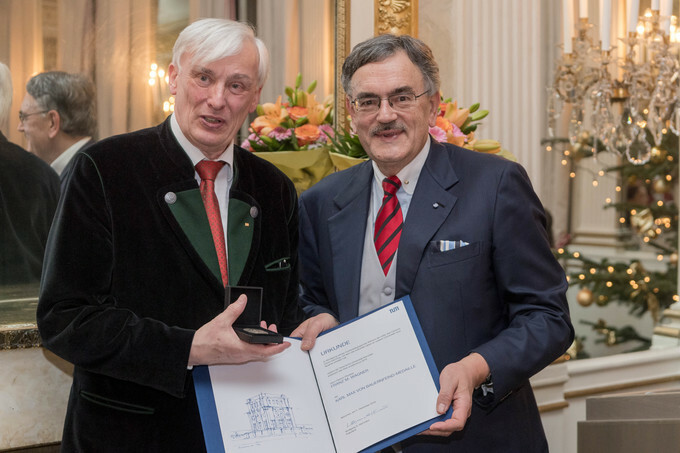 For his commitment to the Campus Choir Garching (CCG), the Technical University of Munich awarded the Karl Max von Bauernfeind Medal to the long-term FRM II employee Franz Michael Wagner. The honored always had the choice between his enthusiasm for physics and that for music. He never decided, but wanted and always needed both and he got it, not in the least with the encouraging consent of his superiors at FRM II. Born in Berchtesgaden, Wagner has learned to play the piano, organ and double bass already in his early youth. This is not surprising, for his father was a music director. Since 1980, Wagner has conducted many different choirs. In 1993, he passed a state examination as a “Choir conductor in amateur music” and continued his education with important teachers. In 2006 he founded the Campus Choir Garching with the support of the TUM President, Prof. Wolfgang A. Herrmann. Since then, he has been studying an extensive repertoire of different genres and of many different countries and epochs. Soon after its beginnings, the CCG performed at many festivals at the three locations of the TUM at Munich, Garching, and Weihenstephan as well as in concert halls and churches in Munich and Garching. In July 2016, the ten-year anniversary was celebrated at Künstlerhaus am Lenbachplatz in Munich. After his physics studies at LMU, Franz Wagner looked for his way as PhD, student of medicine, and as developing physicist in industry before Prof. Lothar Koester hired him in 1980 as a scientist for the fast neutron beam at FRM I. Since 1989, Wagner was also a radiation protection officer at the FRM and the FRM II. Since 2005 he is responsible for the scientific instrument MedApp that doctors of the Department of Radiation Oncology of TUM use for irradiation of malignant tumors with the aid of the highly effective fast reactor neutrons. Actually, Wagner has been retired since 2014, but the TUM continues to benefit from his two passions, physics and music. Karl Max von Bauernfeind was the founding director of the “Polytechnic School” in Munich, predecessor of the Technical University of Munich, who every year honors employees for their special dedication, innovative ideas and valuable suggestions with the Max von Bauernfeind medal. On the occasion of the Dies academicus 2016 Franz M. Wagner received it “In recognition of his work as a musical teacher as director of the Campus Choir Garching, by which the cultural life at our university has received new accents”. In addition to the musical work, President Herrmann in his laudatio also appreciated the physical work of Franz Wagner which resulted in about 80 publications.